American watch manufacturers Hamilton have been making ground breaking watches since 1892. Leaders in style and design, this black rubber strap watch is set with a distinctive yet simple black dial. Powered by automatic movement with date function, this Hamilton combines premium function and design. 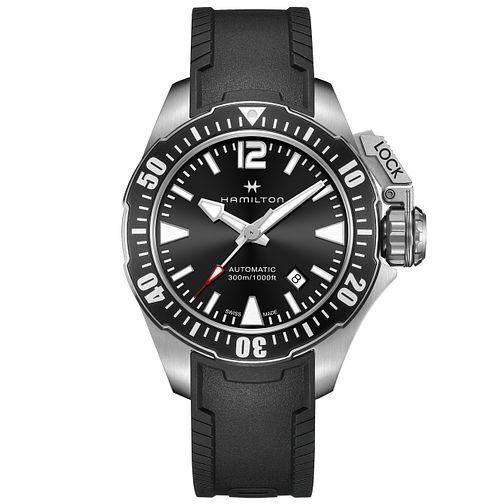 Hamilton Frogman Men's Stainless Steel Strap Watch is rated 5.0 out of 5 by 2. Rated 5 out of 5 by Anonymous from Good looks, good quality I do like the Hamilton brand, good quality watches in this class of cost. The watch does look really good and keeps good time, I have many watches so don't wear it daily (approx. once a week). The only negative I have (not worth dropping a star) is the strap is quite tight sliding into the clasp nearer the tighter holes, feels like I'm pulling too hard to do it up but this might ease as time goes on? Excellent service as usual from EJ, Leamington Branch.